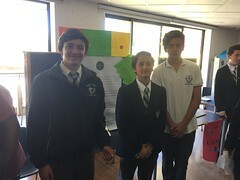 On Monday April 11th, Vicente Carmona of 4 Medio represented Mackay at the AB annual writing competition. 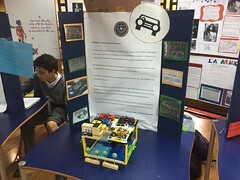 Vicente put his creative abilities to the test against a fierce field of competition at the Dunalastair school in Santiago. After arriving at the school, Vicente was treated to breakfast while he warmed up by improvising stories with coach and English teacher Christian Fetterman. Vicente mentally preparing himself for the start of the exam. 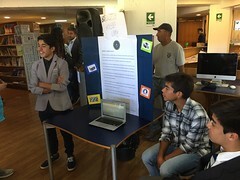 From 12:30 to 2:00 Vicente joined the remaining teachers and students who were treated to a class on improvisational comedy hosted by Chilean bilingual actor Ignacio Navarro. 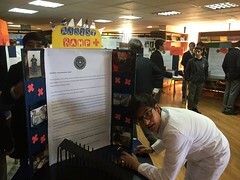 Here students from all over Chile had a great chance to create humorous scenes and build bonds with one another. Meeting new friends at lunch. 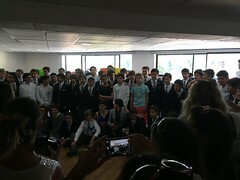 After a snappy lunch, members of the competition returned to the hosting room for the awards ceremony. 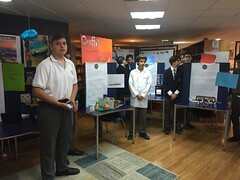 Although Vicente did not receive first prize, he was thankful for the opportunity to compete and is excited to continue pursuing creative writing as a hobby in the future.